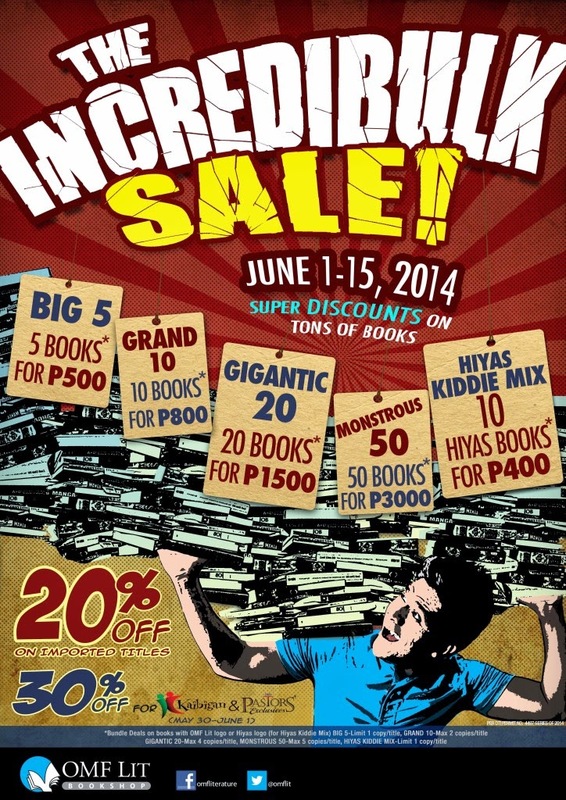 THE INCREDI-BULK SALE will run from June 1-15, 2014 at all branches of OMF Lit Bookshop and Passages nationwide. A first crack on the sale awaits Kaibigan Card and Pastors’ Exclusives members on May 30-June 1, 2014. To find the nearest OMF Lit Bookshop or Passages branch, check www.omflit.com/bookshops. Get ready for a night of insightful stories and inspiring songs as international and local musicians and artists join together in a rare opportunity to lead in worship celebration, namely (1) Dove Awardee and international contemporary Christian group The Katinas, (2) Philippines’ pop rock princess Yeng Constantino, (3) singer-turned-minister Ray An Fuentes (4) hip-hop and R&B singer Quest, and (5) new praise and worship team Firebrand. 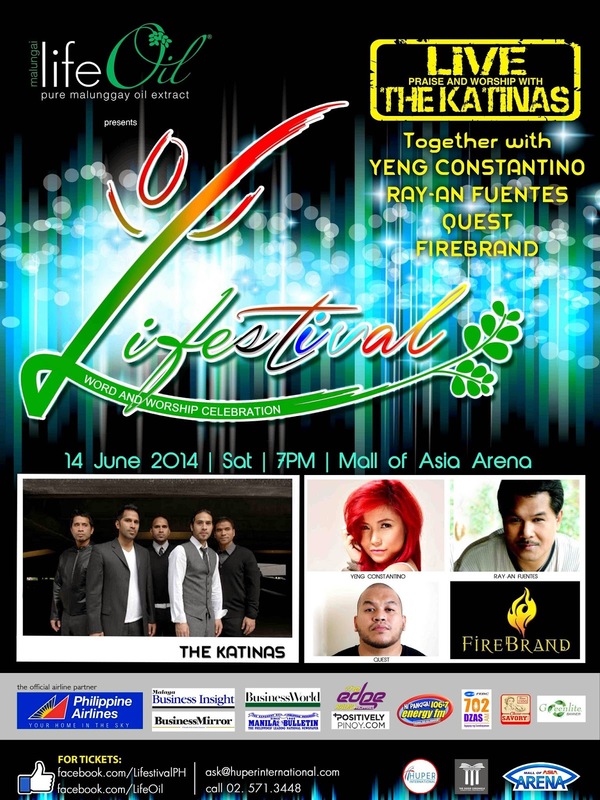 Happening on June 14, 2014, Saturday, 7:00PM, at the Mall of Asia Arena, LIFESTIVAL Word and Worship Celebration is a free thanksgiving offering from Life Oil® in celebration of its fifth anniversary. Everyone who is interested to avail of free Lifestival ticket will only have to like the official Facebook page of Lifestival and send a private message that include the following: complete name, address, mobile number, and the message LIFE IS GOOD! I WANT A FREE TICKET TO LIFESTIVAL WORD AND WORSHIP CELEBRATION! A confirmation message will later be sent individually to all those who will qualify for free tickets, with details on how to claim their free tickets. About 10,000 people are expected to grace the event, including those from various organizations, companies, and churches, headed by the massive network of G12 member-churches. G12 Coordinator for the Philippines and Doulos for Christ World Harvest Ministry’s founder and senior pastor, Bishop Oriel Ballano, will also share the Word of God. It took us almost 12 years to finally have the house that we can call our own so John and I were meticulous with how we wanted it done. When John asked me for the design I want, I just told him to give me a nice bathroom with a bidet for I long to say goodbye to timba at tabo (pail and dipper). John gave me what I wanted, both bathrooms (second floor for the guests and ours) have their respective bidets. John wanted bath tub so he designed to have one for the family bathroom. The bath tub is originally made for that important "husband and wife time" (wink, wink), but it's our youngest son who regularly uses it. It takes about 35 gallons of water to fill the tub so every after Juancho's bath, I make sure to put the water in good use. This is where timba and tabo comes back into my life. I thought I said goodbye to them for good but I can't take wasting water for I was born in the 70s when clean water was scarce. Imagine lining up for long hours everyday to fetch clean water for the whole family, that's why I'm strict when it comes to conserving water. 1. Don’t leave the tap running. 2. Stop that leaky toilet. I remember a few years back, our water bill shoot up from P150 to P800+ because of a leak left unfixed. 3. Repair dripping faucets immediately. 4. Use glass when brushing teeth. 5. Since it's already rainy season, collect rain water that you can use to clean and water your garden. For car owners, you might want to try WASHBOI WATERLESS CARWASH, you'll surely help conserve tons of water every year. 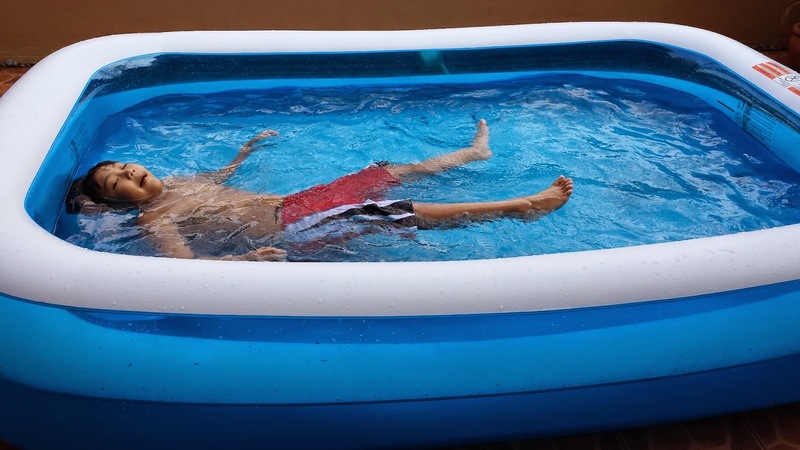 Imagine what I'll clean after Juancho uses the inflatable pool! I grew up seeing my late mother take Myra E so I'm quite familiar with the brand. Yesterday, a special packaged arrived and inside is a personalized make-up kit, with Myra VitaGlow BB Cream. Why use Myra Vitaglow BB Cream? • It contains Vitamin E. This helps nourish your skin even more, so your complexion appears younger-looking and healthy. • It doubles as foundation to help you even out your skintone perfectly and hide pigmentations. • It contains skin-enhancing minerals, with light-reflecting shimmers in this cream will make you look like you’ve got a lit-from-within glow. • You can use it as concealer. Just pat an extra layer of Myra VitaGlow BB Cream to camouflage dark spots and blemishes. • It has SPF15 to protect you from harmful UV rays that causes premature aging. • It’s hypoallergenic. Girls with sensitive skin don’t need to worry about breakouts, because this dermatologist-tested cream is proven safe for daily use. • It's affordable, for only P99 a tube! Here's a step by step guide on how to apply Myra VitaGlow BB Cream by Ana Victorino, local YouTube sensation and beauty video blogger. My husband is a certified chocolate and coffee addict. Plus, banana is one of his few favorite fruits. To quench his thirst this summer, he concocted Bananocha Smoothie for My Great Food 15-Second Cooking Challenge. Juancho likes hotdogs a lot so to make a healthier version John and I make sure to saute Purefood's Classic Hotdog and Purefoods Chick and Cheese hotdogs with plenty of tomato, garlic and onion. For taste, add oyster sauce. Watch how we cook Juancho's Sauteed Hotdogs by clicking the highlighted title or click this link: http://instagram.com/p/odkxwWwRT4. Last May 16, at Planas Garden, Quezon Memorial Circle, Takbo na! 24 Hour Renewal Run had its soft launch. 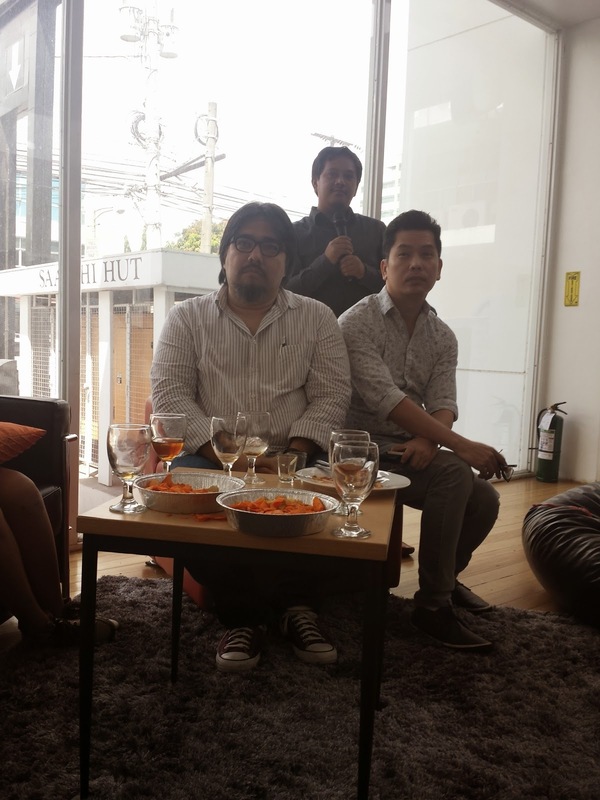 Attended by its two proponents, Fr. Robert Reyes - The Running Priest and Cesar Guarin - Global Runner, and all the volunteer members. The program started at 6am with performances by Edru Abraham/Kontra-gapi and Heber Bartolome, and talk by Health & Wellness Expert Dr. Marissa Guinto-Adviento). Takbo Na! 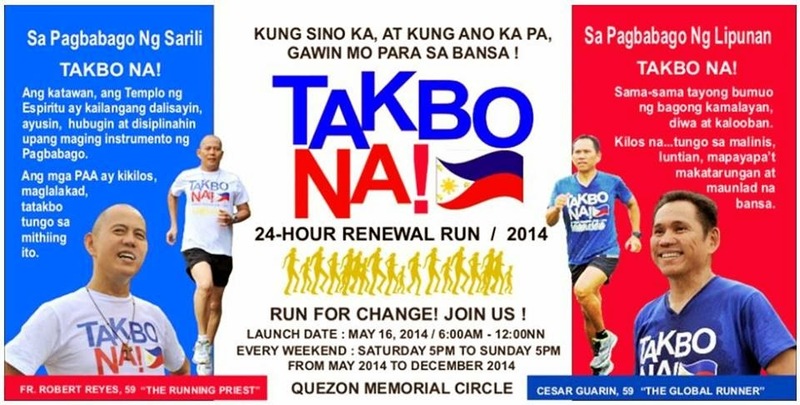 24-Hour Renewal happens every weekend, Saturday 5pm to Sunday 5pm, from May 17-18 to December 27-28, 2014. No registration fee, but you will fill out a registration form. The run is actually a relay run, and you can RUN or WALK at your own pace, as long as you are able. You don't need to run the entire 24 hours. What is more important is your long-term commitment to personal and social renewal. Run with Cesar Guarin, Global Runner and Fr. Robert Reyes, Running Priest and start the process of personal and social renewal through running and walking for 24 hours. Running as any transformative activity develops commitment, regularity, and consistency. As the run and walk unfolds, artists like Heber Bartolome and Edru Abraham through music and percussion will appeal to the Filipino soul and awaken its love for the Mother Land and her people. As we run or walk, let every stride or step be an unspoken prayer for change. Let the run stir up and spread the spirit of service and sacrifice in everyone. One day, as we complete yet another 24-hour run, we may at last smile and celebrate as runners and athletes would the completion of a life-changing and most memorable race. Jasmine Curtis-Smith is definitely one of the most sought-after young actress and brand endorser today. She is also TV5's Princess as she makes one project to another. 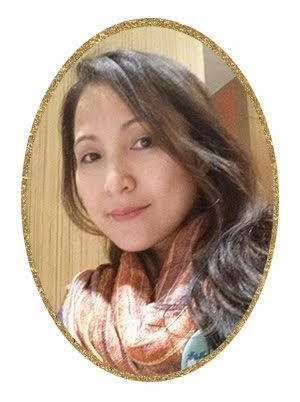 On her next project, Jasmine will portray a fictional character of herself, billed simply as ‘JasMINE’. JasMINE - Suspense Drama Series revolves around an actress who will have a conflict with a stalker called "Maskara." Maskara stalks Jasmine, sends her gifts, flowers and love letters sent to her location shoots. To make the plot more interesting Jasmine must find out who Maskara really is. 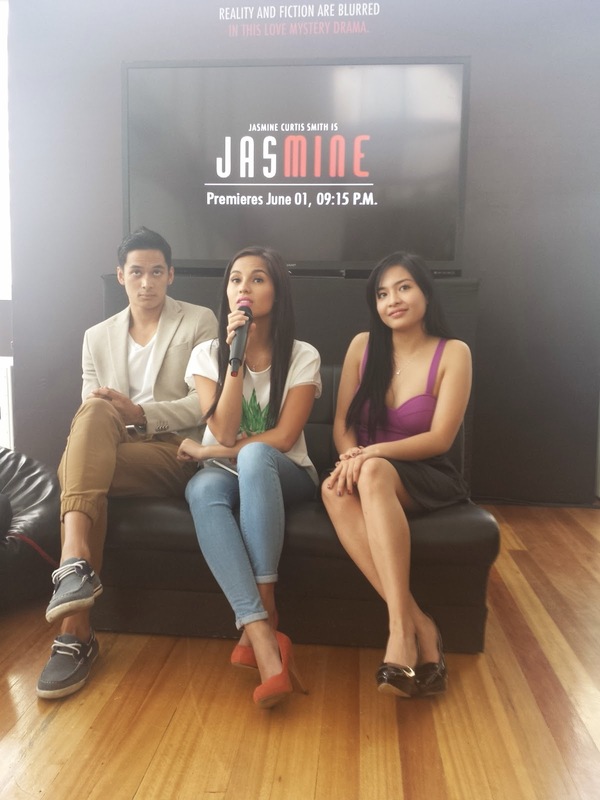 Jasmine is directed by Director Mark Meily, and is co-produced by Unitel and Ace Saatchi & Saatchi. The other actors are Matt Padilla (older brother of Daniel Padilla), Carlo Orosa, Alwyn Uytingco,Gerard Sison, Nicole Estrada, Cai Cortez, Marvelous Alejo, and many more. The pilot episode will be shown on June 1, 9:15PM. I used to be a resident of Quezon City. I also worked for Quezon City hall for 2 years. For twenty plus years living there, I probably visited The Quezon Memorial Circle for just a couple of times. Most of those visits was just to eat at Max's. Rafael and Julia recently learned how to bike. So last Thursday, John decided to have them tested for a longer road biking. Off we went at Quezon Memorial Circle. Quezon Memorial Circle is a national park and a national shrine located in Elliptical Rd, Quezon. I was amazed at the big improvement of the place! They now have meeting, conference and sports venues, covered courts and stage, and tropical and meditation gardens. This park is a fitting place for families to bike together, play badminton, have picnic, exercise or plainly to relax. The dense presence of trees make the humid weather tolerable even in the afternoon. Spending a day here is so affordable. Parking fee is just P15. If you wish to really save money, bring pack lunch or go at Ces Garden Cuisine for an eat all you can breakfast during weekends, for only P129 (adult) and P99 (kids). Because we enjoyed our first day, we went back the next day. I found that there were more to this place than trees. I met some people and interviewed them. Ms. Nel Villoria of Caloocan, exercises at Quezon Memorial Park twice a week. Join Zumba from 6AM TO 8AM, Monday to Sunday, for P20 only. For the third straight day, went back again last Saturday, now with Nora, Maizi and Jill. On an ordinary day, when there are no special events there, there weren't too many people at the park. On a weekend, there are tiangges and more food booths. What's great about rediscovering Quezon Memorial Circle? It's always Christmas here (wink! ).